Black aluminum construction assures stability. Top loading graphics have a rigid insert which prevents warping. Flexible lenses keeps curious fingers off images. 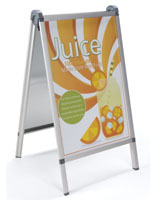 Are you shopping for a poster stand for a retail store? 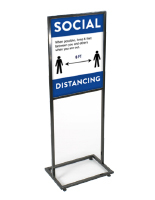 Do you need to post a permanent sign in a lobby or office setting? 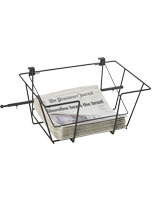 This poster stand is an effective and practical solution to either situation. The lightweight aluminum construction makes this sign display a popular choice for users that need to move the unit around on a regular basis. This poster stand, also called an aluminum sign frame features a black painted finish that will not detract from the signage on display. Each poster stand that holds a 22" x 28" graphic is easy to change out, and update. 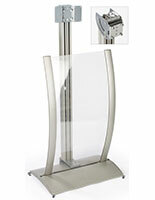 The top features a slot, allowing users to slide the old images out and replace with new signs. 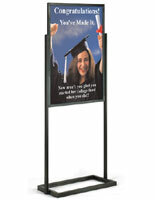 This sign frame, poster stand is double sided allowing for twice the advertisement space. 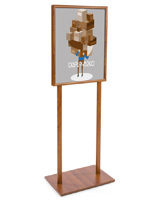 Use this print display to greet customers as they enter a lobby or store entrance. 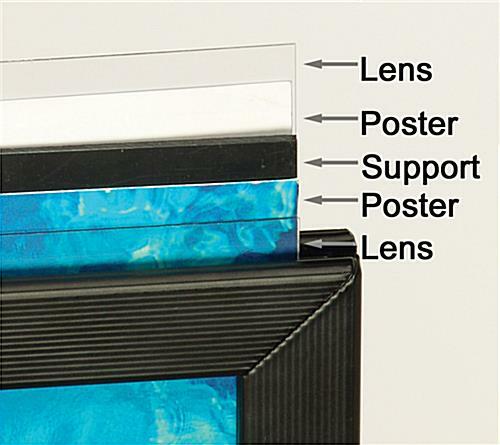 Each poster stand features a rigid support panel that keeps the graphics upright as well as two non-glare lenses. The lenses help to keep the promotional signs protected from airborne dirt as well as fingerprints. This poster stand that is made from aluminum ships unassembled. The frame attaches to the base with just two screws (also included). 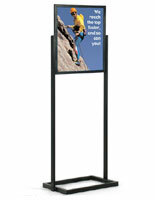 Buy this poster stand with a black finish for your store or lobby today! 27.8" x 63.0" x 15.0"
i really like these poster stands. they are light weight and easy to move around. i think the method of connecting the legs to the base could be simplified some, but not too difficult. The only thing i wish it had was a clear poster protector. these come with a matted look over your posters, and it does take away some of your color in posters. We always have a thin piece of plexiglass cut to fit the frame so it is a clear look. Thank you for the helpful feedback, Karla! These went together easily and are light weight making them easy to move. Thanks for another great review, Susan! Unfortunately our non-glare lenses often give a bit of a "frosted" look; if you would like to discuss returning or replacing your item, our customer service representative will be happy to assist you. They are available via phone, live chat, or email. 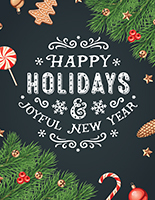 Product and service was great, we received everything in a timely manner and was in great condition and very easy to put together. These are a great sign display, very sturdy, and able to show lots of information right at eye level.